There’s a trend happening – more businesses are moving to downtowns across the country. Smart Growth America recently released a report titled Core Values: Why American Companies are Moving Downtown that discusses why these businesses are moving downtown. One huge factor? Walkability. Businesses are moving to downtowns that are walkable. Smart Growth America found that these companies were looking for locations where their employees could take public transportation to the office and entertain clients at various locations. They want to be located in downtowns where they can easily collaborate with others in the industry and run into business partners while they’re going to grab their morning coffee. These companies also say that walkability helps attract millennial workers, who are graduating college and looking to move into these downtown areas. This isn’t just happening in big cities like New York or Chicago, it is happening in Orlando as well. 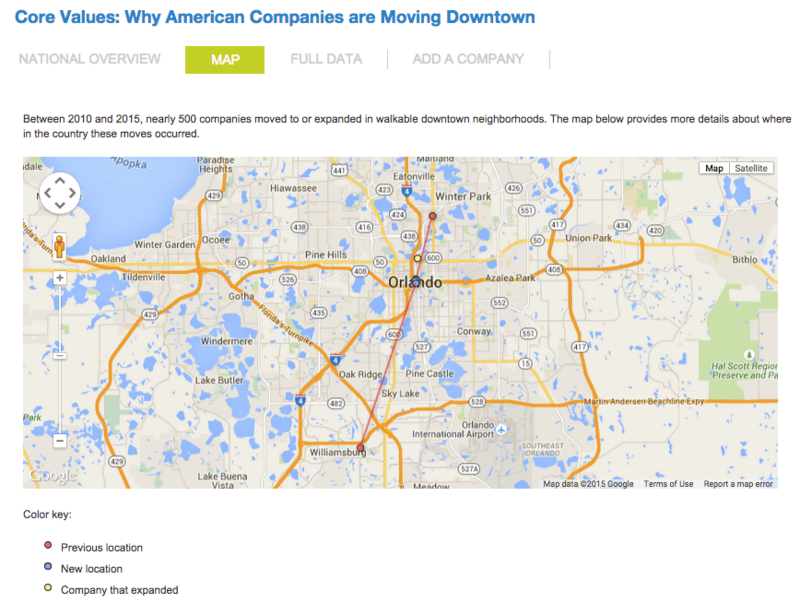 Take a look at this map provided by Smart Growth America and note the three Orlando businesses that have moved into downtown locations – Red Lobster, CBRE, and Moore Stevens Lovelace. Check out the full report here and watch a webinar on the topic from Smart Growth America here.